A Splash Rafting Marrakech Morocco short activity break is designed for all you hard working people who need a bit of sunshine and adventure in your life but are short on time due to the demand of work. A combination of magical Marrakech, cheap airlines and of course the Splash crew combine to serve up a short break that will thrill and inspire you. Arrive Marrakech airport which is right on the edge of the city only 4km away from the centre so no long transfers. You will be collected and whisked away straight to your accommodation or straight to the first part of your adeventure depending on your flight arrival time. 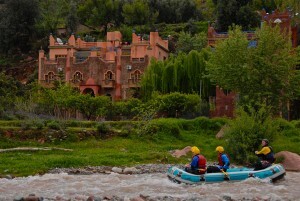 Rafting the Ourika river. 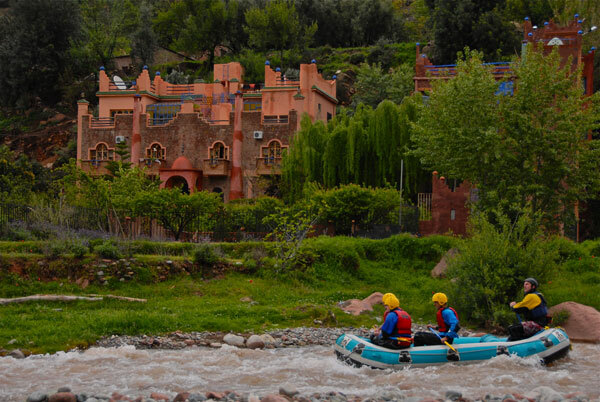 The Ourika valley is a stunning location just one hour from Marrakech and this is where you will do your first rafting trip. The huge Atlas mountains are your backdrop to this stunning location but you will not be on your own as this valley is a huge tourist destination and also for locals who want to sit by the river and enjoy the mountain air away from the heat of the city. Your first evening will be spent getting lost, yes I did say getting lost! Of course we will take you back to your accommodation but you will be itching to get out and explore the souks of the medina. Everyone gets lost the first few times so do not worry. Your will always find your way back to the stunning Jamaa El Fna Plaza to start all over again. The evenings are the best time to experience this unique environment. After a good nights sleep in your riad and a local breakfast if is on the coach and off to a remote valley in the Atlas mountains and a river trip that will show you how the local rural people live. This is a very different river from the previous day one and will include a stop for lunch on the way down. At the end of the trip you will be thinking you have been transported to a different world but it is back on the transport and back to Marrakech. This evening is the time to get out their and snap up all those bargins you had your eye on the souks. Remember, a good ” haggle” is part of day to day life here so never pay the price until your are happy you have a good deal. We will advise you on excellent venues to eat to sample the local tagine and you will be surprised by the value. When the evening draws to a close you have another niht in your riad which are an experience in themselves! Many people leave wanting to own one. We collect you and return you to the airport to fly you back to another world refreshed and inspire to take on anthing the boss throws at you. This magical short break in exotic Marrakech with adventure you dream about is £299!